By now we’ve all heard about social media marketing for law firms and other businesses. Everybody online seems to be talking about Facebook likes, Twitter followers, LinkedIn connections, and even using Instagram, Pinterest, and Slideshare to market companies and firms of all sizes. But what does a successful social media campaign look like? And what approach should lawyers take when starting a solo practice? 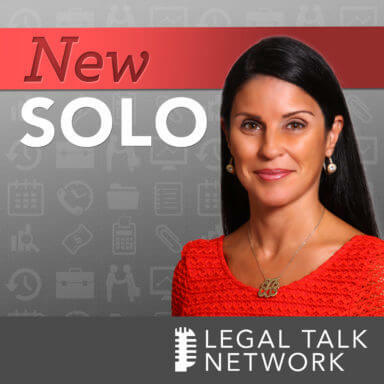 In this episode of New Solo, Adriana Linares and Jason Marsh interview C. Todd Smith, a small firm lawyer who has used various forms of social media for marketing his practice. Jason Marsh, an online marketing specialist for small businesses and law firms, also gives his insight into the importance of social media. For lawyers launching a solo practice, this podcast will provide a broad idea of where to start with your social media campaign. Todd Smith recommends that lawyers choose one or maybe two platforms to focus on rather than trying to tackle all of them. C. Todd Smith has been practicing law for 20 years in the Orlando area. He is the founder of a small law firm which focuses in the area of plaintiff’s personal injury law. Todd entered his company into Social Madness, an Orlando Business Journal social media contest and did very well because of his business’s active Facebook page. He is also very involved with Kiwanis, an organization providing teaching service and leadership to young people around the world. Adriana Linares: Hello and welcome to New Solo on Legal Talk Network. I’m Adriana Linares, I’m a legal technology trainer and consultant; I help lawyers and law firms use technology better. Before we introduce today’s topic, we’d like to thank our sponsors at Solo Practice University. Today I’m very excited to welcome C. Todd Smith to the show. I’m actually at his office in Orlando, which is very cool, the Legal Talk Network guys have given me a traveling podcasting station, so I’m very excited to be here. And I have a special co host today. On our first episode in this marketing series, we spoke to Jason Marsh, and I asked Jason if he would come with me and talk to Todd, so hey Jason. Jason Marsh: Hey, how are you doing? Adriana Linares: Doing great. Tell us a little bit about yourself in case someone hasn’t listened to the last episode, which of course they should. Jason Marsh: Yeah, they definitely should listen to the last episode, but I am an internet marketing specialist. I work with a lot of law firms, small and medium sized firms, working on their internet presence to generate more clients online. Adriana Linares: Excellent. Hey, Todd. Todd Smith: Hey, how are you doing? Adriana Linares: Great. Thanks for having us, you have a very cool and modern office down here in Thornton Park, Florida. Wait, no, we’re not in Thornton Park. Adriana Linares: Baldwin Park, damn, I get all our parks confused. Todd Smith: Well thanks for coming to see me. Adriana Linares: I’m glad to be here. Tell us a little bit about yourself, your practice, and you’re a true solo, right? Todd Smith: Sure, I am a true solo. I’ve been practicing law for twenty years here in the Orlando area, and now I have a small personal injury law practice representing plaintiffs in all kinds of personal injury cases. Adriana Linares: We should say though, you aren’t solo as in totally solo in your office, because you have the ladies of Todd out there. Todd Smith: That’s true, as you like to call them, the ladies of Todd. We have a great staff and a great associate attorney who works with us here in the firm, and the ladies of Todd do a great job. Adriana Linares: They do, you’re very lucky, you have an awesome group to work with. So I wanted to come and talk to you specifically because I feel having known you for many years, we used to be neighbors, which is a funny thing. We weren’t friends until after we weren’t neighbors, which was kind of funny. Todd Smith: In fact, I’m not sure if we ever even spoke, maybe a wave here and there. Adriana Linares: A wave from one driveway to another and then years later, we’re like, “Wait, you’re a lawyer? Did you used to live on Miles?” It’s kind of a funny thing. But I’ve been watching you from my window first – I’m just kidding – but watching your presence locally as far as Twitter and Facebook; and then I am going to specifically ask you about the contest that you entered that the Orlando Business Journal did. But before I ask that, tell me a little bit just about when you decided to start using social media and your approach to it and why you decided it was going to be important to you as a solo to dive into social media. Todd Smith: Sure, well 7 or 8 years ago, I started looking at different social media outlets and even back then that’s really kind of at the end of when Myspace was still really kind of popular but almost before it started to kind of go away. And some of my close friends were really active on Myspace, and I was checking it out. For some reason, I was real hesitant about it, never got on Myspace, but then Facebook kind of started to get more and more popular, so I got a personal account on Facebook and just loved it. As a college student, I was a communications major, so this whole change in the way we were communicating started to happen through social media, and I just thought it was really interesting. But I started looking around for other law firms and other attorneys and there weren’t really a lot of attorneys who were using Facebook at that time; certainly my peers and colleagues in Orlando that I knew. So I created a Facebook page for my law firm and didn’t really know exactly what I was doing, but just started reading a lot more, following blogs, and got excited about social media. Adriana Linares: And did you have some good, initial success with Facebook? Did you say, “Holy moly, this might actually get some traction here,” how are you using it? Todd Smith: Well at the time, really, I thought it was just this super cool way to get in touch with my clients that I had, former clients. I grew up here in the Orlando area, and what the beauty of Facebook is is as soon as you create your account, every person you knew in high school subscribes or likes your page or becomes your friend on Facebook. So I thought it was a really quick and easy way to make contact and establish contact with a lot of my old contacts from high school. Adriana Linares: And in a practice like yours, your goal in marketing is to be top of mind, so that when somebody needs a personal injury attorney, they think of you first, right? Todd Smith: Yeah, absolutely, and that’s the thing about trying to market a personal injury practice is it’s such a random thing that happens to people, it’s an accident, after all. And so it’s not something that everybody’s going to need your services every day. So you have to be top of mind awareness, and the way most larger personal injury firms in town – and certainly we have a lot of them in Florida that are set up this way – do a lot of TV advertising, billboard advertising, park bench advertising, bus advertising, and I didn’t do any of that broad advertising. It really just didn’t fit my personality to do that kind of broad advertising, I was really more interested in making connections with people and my clients and referrals and word of mouth. And so social media’s really helped me in building those relationships with my former clients, keeping those relationships, and then also with all my contacts and friends and people in time. Jason Marsh: It sounds like you did a really good job using Facebook to build your personal brand within your personal network, the people you already knew. You once told me a story about how I think you ran into someone that you hadn’t seen in literally since high school, 20 years or something like that. Some elevator doors opened and what happened? Todd Smith: I’m so glad you remembered that because that’s kind of when the lightbulb went off and said “Oh my gosh, this social media thing is really effective and could really work for what I was using it for.” I was actually going to an Orlando Magic basketball game, and I got off the elevator, and someone that was working there at the arena was someone I knew in high school. We weren’t real, real close friends, but I knew her fairly well, but I hadn’t spoken to her in over probably 20-25 years. And the first thing she said was, “Oh hey, Todd, how are you doing? How is your law practice going?” And the connection was that she had liked my Facebook page and had been following things happening with my firm and my practice even though we hadn’t actually spoken or seen each other in 20 years. Adriana Linares: Oh, wow. Perfect. That’s amazing. What about Twitter. Tell us a little bit about Twitter. Todd Smith: So Twitter, I’m still trying to figure out how to use Twitter for my clients because I don’t feel like I’m connecting with a lot of potential clients through Twitter. But the value for me through Twitter is a lot of professional connections. So a lot of my attorney friends that are in town, they’re on Twitter, so it’s an easy way for me to have a dialogue and communicate with them, and also a lot of other attorneys that I admire and do great work that I can follow them and kind of see their updates and things they’re working on. That’s also very valuable. Jason Marsh: I wanted to go to Facebook real quick because Facebook, as you know, in terms of the organic reach of a page of business or an organization page versus a personal profile, has been throttling back the reach; how many people we actually see or post. What’s been your experience with that, specifically? Todd Smith: Well some people gripe about Facebook because they make all these changes every few months. I actually think it’s kind of fun because you have to stay on your toes and keep up with what they’re doing. So I kind of see it as a challenge. But when I first launched my Facebook page for the firm, I used my personal page and all my friends and contacts that i had to kind of say hey, here’s my law firm page also to promote the actual page. So my first group of 500 subscribers to my firm page were really just friends and contacts and people I knew that had been following me on Facebook already, and I would post something or share something on my law firm page and I was getting organic likes and subscribers that way. Then I started transitioning, I got to a level of about 500 folks and I could not get any more followers. So I started paying for advertising on Facebook and paying not a lot, maybe $100 a month and then pretty easily, and without a lot of work, grew to about 2,000 subscribers to my Facebook page. And for a while, that was fantastic because I had a great dialogue going, lots of response, lots of organic reach, and was very active on the page. And then they changed how the algorithm worked. And that’s the throttling bag that you’re talking about. Jason Marsh: Yeah, it’s really become a pay to play environment, hasn’t it? Todd Smith: It has, and so I will still, every once in a while, if there’s a post that I really think will connect with people or create a little bit of a conversation, I will boost that post, even for $5 or $10 here and there and get a lot more reach when you do that. But that now is really the only way to get people seeing what you’re posting. Adriana Linares: I mean, it’s just such a nominal amount. Todd Smith: Yeah it’s a nominal amount and I still believe there’s a lot of value there and if you want to do something more, throw some more dollars at it, you’re definitely going to get better results. Adriana Linares: And you must have gotten on pretty early because your vanity url is great. You have Orlando Injury Lawyers, so you’re Facebook.com/OrlandoInjuryLawyers, I mean you must have just hopped in on that thing. Todd Smith: Well I think that’s the thing too, I was talking about how all the changes that Facebook makes, if you’re not paying attention and you’re not ready for those changes, then you’re behind the curve. Adriana Linares: And you do all the posting yourself, you don’t have someone else do it for you. Todd Smith: Correct, I’ve always done everything myself. Adriana Linares: That’s very good. Todd Smith: Yeah, and I thought about and looked at those services and kind of checked them out that they’ll post so many times a week or whatever that is, but to me those posts are kind of bland and not really a reflection of me or my personality and that’s the whole point. I’m trying to connect with people personally, I’m not trying to just throw something out there and get a few likes here and there. Adriana Linares: Alright, well before we move onto our next segment, we’re going to take a quick break to hear a message from our sponsors. Adriana Linares: Welcome back to New Solo, I’m Adriana Linares. Jason Marsh: And I’m Jason Marsh. Adriana Linares: Before we left off, we spent a lot of time talking about Facebook; we dabbled in Twitter a little bit. What about some of the other popular social media platforms like LinkedIn or Pinterest? Do you use any of those to promote the law firm? Todd Smith: I don’t, I use LinkedIn, and that’s really more for a lot of my business and clients come from referrals from other attorneys. So I really use LinkedIn more for keeping in contact with other attorneys that are referral sources for me. But I’m not super, super active on LinkedIn. Adriana Linares: And what other types of advertising do you do or have you done? Anything that’s not necessarily social media but you have found successful that you could share with our listeners? Todd Smith: Well, I don’t know if there’s anything else I would say that I found successful. 20 years ago I did a little bit of TV advertising, and that’s of course the problem. You can’t do a little bit of TV advertising. You’re either all in or you’re not. But as a young lawyer who didn’t know what he was doing and a sales guy comes in and says, “You can be on TV!” It’s like, “Okay, I want to be on TV! I can talk, I can stand in front of a camera.” So it was super fun to shoot a couple of commercials and it was also, of course, cool when you’re watching Judge Judy and then hey, there i am. So you’re trying to impress your friends that you’re on TV, but it wasn’t very effective for me in the kind of marketing that I was doing, because I didn’t spend enough money on it. And then I was in the yellow pages for a while, and that’s kind of a traditional. Adriana Linares: Are you still? Todd Smith: No. Finally got out of the yellow pages a few years ago, and that was one of those things too, I just asked everybody I knew, “Do you use the yellow pages?” And everybody’s answer was no. And the first thing that I would do with the yellow pages was throw it in the recycling bin, so. Adriana Linares: It’s never made it inside my actual home since they’ve been leaving them for probably 15 years. Straight from the step, into the garbage, it’s unbelievable. I’m going to ask you one more question non-social media related before we go back to it and that is you have a great location here. So you used to be downtown, you moved a little bit outside downtown but now you’re still in a very good location. Has that affected either walk-ins or your marketing ability in any way, your physical location basically? Todd Smith: Right. Well, for me, and I’ve always been about trying to make the customer service or client service experience the best it can be. And I know traditional law firms and bigger law firms love the idea of being in the high rise tower downtown, but I just found – especially for my clients – it’s such a hassle to find parking downtown, dealing with traffic, trying to get inside the building, go up the elevator, find the office location. So I’ve always wanted to be very accessible to my clients so that it’s easy to get in and out of my office. So this location in Baldwin Park, Baldwin Park’s a beautiful little village center. We have restaurants and other office space around and some retail. It’s a first floor office, parking right here on the street, and it’s just an easy little community environment, easy for my clients. Jason Marsh: In fact, you’re on a main street in a great neighborhood and community here. Do you get a lot of walk-ins through the door? Because you have a very prominent office on this street. Todd Smith: We do occasionally get walk-ins and we get a lot of foot traffic. people are walking up and down this street all the time. So I actually thought I would get more walk-in traffic than I have, but we do still get some. Jason Marsh: And have you ever gotten a call where someone just happened to walk by? They’re familiar with their brand from having just walked past it. Maybe they didn’t walk in the door to schedule an appointment but said, “Hey, I’ve walked past your place or I’ve driven by it a number of times.” In other words, you’ve been building your brand in that way. Todd Smith: You know, I don’t know specifically about clients that have had that experience, but I have had a lot of contacts and people that I know in the area. There are other attorneys who live here in Baldwin Park and they’ll always comment that, “Oh, I walked by your office the other day.” So again, that even helps with some of that top of mind awareness, and like I said, referrals from other attorneys are very important to me. So it’s good that people know I’m here and they see my office when they walk by. Adriana Linares: So I wanted to make sure and ask you about the contest that you were in. Was it two years ago? Todd Smith: I think it was two years ago. Adriana Linares: So this a very cool thing that the Orlando Business Journal – which is part of the national business journal group – they do a contest, and you’ll have to remind me a little bit because I don’t remember. I get the Orlando Business Journal and I remember when they were soliciting people’s companies to enter the contest, and it was a social media contest, specifically. Tell us a little bit about what it was and how you decided to throw C. Todd law’s hat into the ring. Adriana Linares: We should not drink beer during these podcasts. Todd Smith: So the Orlando Business Journal, I follow them on Twitter, and of course you know if you’re an attorney in town, it’s one of those publications you kind of keep an eye on. And they had posted something about a social media madness contest that they’re having. And as far as I know, they still have this annually, but it was a couple of years ago and you had to submit the link to all of your social media accounts for their consideration, and then they qualified you to be in the contest. I think it started with 20 or 30 businesses that were in the contest, and the first round was two weeks. Adriana Linares: And they were grouped into firm company sizes. Adriana Linares: So small companies, mid-sized companies and large companies. Adriana Linares: Which made it more fair, which I thought was good how they do that. Adriana Linares: Who’s name will not be mentioned here. Adriana Linares: But might rhyme with Mariton. Todd Smith: -beat me out, but I still to this day contest the results. But anyway, it was a lot of fun and through doing that contest, what was neat about it is I got a lot more likes and people that had subscribed to my Facebook page. So I got a lot more engagement because I was really active for those couple of months while the contest was going on. And also just communicating and tweeting with some of the people from the Business Journal and some of the other businesses that were in the contest had some fun tweeting back and forth with a couple of the other businesses, so it was a great contest? Jason Marsh: What about Foursquare? Do you ever encourage your clients to check in when they visit you in the office? Todd Smith: You know, it’s one of those things that I think that would be a great idea and I have had some events at the office. Like if I’ll do a happy hour or have some friends come over to the office or something, I’ll say hey, if you guys want to do me a favor, check in on Facebook or wherever you are. Jason Marsh: Or maybe throw a selfie on Instagram. Todd Smith: A selfie on Instagram, that works too. Adriana Linares: Are you on Instagram? Jason Marsh: You can always post like a really creative photo of a car accident. Adriana Linares: I mean the filters they have are amazing. Todd Smith: Yeah, like X-PRO2 or something on a really nasty car accident. Adriana Linares: Well i have a lot of respect for that, you don’t want to become that guy. But I suppose it’s just another source of platform that might bring bigger, broader awareness. Any other new and fresh ideas that you’ve been thinking about implementing or joining or looking at? What’s next for C. Todd Smith law? Todd Smith: Well that’s a great question, I’m always thinking about what’s next, and even in just the technology area, I’m always interested in what’s going to be the next thing that’s going to change how we do things today. Adriana Linares: Wow, you’re really not like most lawyers. Todd Smith: I’m obsessed with self-driving cars and the Google car that I’m afraid is going to put me out of business, and it’s just a matter of will it be ten years or will it be 20 years or will it be 30 years, but eventually, car accidents are going to be relatively few and far between, I think. Adriana Linares: Well you’ll just have to pivot your practice to something else if that happens. Todd Smith: Exactly, exactly. So until the robot cars take over, I read an article recently about the demise of teenagers using Facebook, has been really overhype. The statistics show that there are actually a lot more teenagers still using Facebook. So I think you’ve got to be careful too, especially as lawyers. If you get caught up trying to be on every social media platform, you’re not going to do any of them very well. So for me, I’m sticking with Facebook for now and still using Twitter and going to kind of see where those go. But what’s next, I’m not sure. There’s something out there for sure that’s going to take over Facebook at some point. We just have to wait and see. Google Plus, I’m on Google Plus but I still can’t get excited about it, but I’m on there and I think it’s important. And even as Jason’s talked to me before, we talked about SEO and Google and that sort of thing, I know it’s a good idea to be there. Adriana Linares: That’s very good. Do you have anything you can add, Jason, about Google and having a presence even though it doesn’t seem as popular as it is? Jason Marsh: Yeah, well I think the biggest thing with Google Plus is the Google Plus local business profile, that’s the most important thing that a law firm wants to make sure they do. So essentially, Google Plus local for business, as a directory for online local businesses. So at the very minimum, you want to make sure that you either create or claim the profile if it already exists, you can claim it and make sure that you add the correct business name, address and phone number. It’s important that those three elements, name, address, and phone number, stay consistent across the web. But just claiming that profile’s important, again, because it’s Google. Todd Smith: Yeah and that’s another great tip, Jason, and I’ve tried to make sure on all of those directories that are out there, and there’s a lot of them. Google, of course, that’s the one you’ve got to be on, Google. But I put my name and address and information and website in as many directories as I can just so I’m out there when people are looking for me. One other thing you did ask about new or different types of outlets, I like SlideShare, and so I put a couple of presentations on SlideShare and those are really easy to share through my LinkedIn page and that content usually goes pretty well with LinkedIn. So yeah, I’ve done some technology presentations and kind of have a whole laundry list of legal topics I want to do short Powerpoint presentations and upload those to SlideShare. I think that’s another cool idea. Adriana Linares: So for listeners who don’t know what SlideShare is, explain it real quick. Todd Smith: Yeah, SlideShare.net is just a website where if you have a Powerpoint presentaiton, you can upload it to SlideShare and make it publically available and it’s super easy to view on mobile devices or iPads and you can also share links to your presentations in a very easy way. Adriana Linares: So it links back to your website? Todd Smith: You can link it back to your website or if you want to send someone a link about the presentation, which is hard to send a whole Powerpoint file to maybe a potential client, you wouldn’t want to do that anyway. But you can send them the link to hey, here’s a presentation I’ve done on whatever the topic is and just send them a link. Adriana Linares: And so from an SEO perspective, Jason, I’ve certainly done plenty of searches for a topic over the past weeks, years, months. And inevitably, if there’s a very highly hit sideshow presentation, it shows up in those results. Jason Marsh: Yeah, there’s no question there’s value. Something like SlideShare’s known as a web 3.0 property. So that property has a lot of authority in and of itself similar to maybe a Facebook, but by starting a profile at that and adding substance and valuable content, that’s just going to help your overall web presence. Adriana Linares: That’s great. I want to go back real quick to the directories, because we talked about Google Plus. Yelp is another one that everyone should just get listed on whether you actively use it or not. Foursquare would be another one. I have my company on YP, yellow pages. Because even though there might not be a need for the physical anymore, I still have it listed in YP. Are there any others you can think of that we want to mention? What about Moz. Jason Marsh: Well Moz actually offers a tool. Adriana Linares: Which I did, I did that. Did you know that I did that? Jason Marsh: Oh, you used it? I didn’t know you used it. But for anybody who’s interested, the tool is you go to Moz.com/local – that’s a free product for you guys over at Moz. But they have a great tool that helps where you can add all of your information and then it will distribute all your business information across many different online business directories including tier 1’s, which are the ones that all the other smaller ones actually license the information from. So if you can get your information in the tier 1 directories – and you can manually submit them yourself but the Moz tool makes it very easy. Nonetheless, all the other smaller ones will aggregate that information from all the tier 1 information providers online. Adriana Linares: You know what’s helpful about the Moz service too is it will actually go and sort of look at all of those other directories and tell you where the information is not consistent. So if you had an old phone number in one place for your office and a new phone number, it will say hey, this information doesn’t match. And I think either they fix it or you go out and fix it. I can’t remember when you go to that service, but it’s very, very good. Jason Marsh: Yeah, it’s a great tool, it’s about $80 per year. Adriana Linares: Yes, I was going to say the only reason I even thought of it is because I just got a renewal notice and I think it was $90 or $99. Totally worth it. Well, before we wrap it up, because we’ve been here for quite some time, I want to ask you Todd about something that’s very important and near and dear to your heart that you love and you do all the time. And that’s your involvement with Kiwanis. Todd Smith: Oh, well thank you for asking me about that. Kiwanis is an international service organization and I’ve been a member for about 8 or 9 years. Kiwanis is celebrating its 100th year anniversary this year, and Kiwanis is a community service organization that’s focused on improving the world by helping children and focusing on children’s issues and also teaching services and leadership to young people. And we really do that through our service leadership programs. Most people have heard of key club in high school, so I work with a couple of different high school groups. And it’s just really cool kind of teaching and inspiring young people to go out and do community service and to volunteer. So that’s something I’m real passionate about and involved in. Adriana Linares: And if I want to get involved with Kiwanis but I’m out in Oregon or in Idaho, can I? Todd Smith: Absolutely. Kiwanis.org, and then click the link to find a club and there’s clubs all over the country. We’re actually in 80 countries around the world, so we’re all over the place and we would love to have all the help we can good. Doing good in community service not only helps your community but it’s good for you. Doing good feels good. So I encourage all my friends and anybody who will listen to me, go out and get involved in community service and volunteer in your community, it’s really important. Adriana Linares: That’s great. Before we finish up, tell everybody how they can stalk you on the internet. Todd Smith: Yeah, I’m pretty easy to find. Google C. Todd Smith law. Or you can find me at CToddSmith.com, or on Twitter @CToddSmith, or on Facebook, C. Todd S. or my law firm on Facebook is OrlandoInjuryLawyers, I believe is the URL for the Facebook page. Adriana Linares: Great, well thanks so much for having us, Todd, we really appreciate it. Jason, thanks for being my rodeur today and helping in. Jason Marsh: Thanks a lot, good to see you. Adriana Linares: And Jason, before we let you go, can you remind everybody how they can stalk you on the internet? Jason Marsh: Yeah, there’s a few different ways. You can email me directly at [email protected] My Twitter is @_JasonMarsh, or the best way is to subscribe to my email list at Marsh8.com/subscribe. You can get lots of great content, videos, podcasts, all sorts of information on how to can grow your practice. Adriana Linares: That brings us to the end of our show. Don’t forget that you can always keep an eye on us – by us I mean New Solo – on iTunes, RSS, Twitter and Facebook. And if you want to learn more about what you’ve heard today, make sure you visit the New Solo page on LegalTalkNetwork.com. Thanks for listening. Join us next time for another great episode and remember: you’re not alone, you’re a new solo.